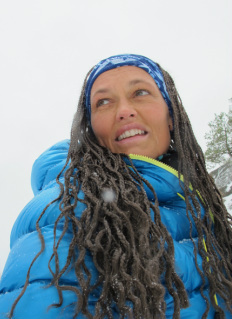 Vibeke Andrea Sefland grew up exploring the hills in the southern part of Norway skiing, climbing, diving, mountain biking and trekking. She is educated in emergency respons and leadership. She has a BA in social sience and cultural awarenes. She has also worked as a mountain guide for several years. ​Vibeke Andrea Sefland has from early age always loved all challenges nature could give her. She was about to skip her education to take advantage of a climbing trip to Mt Blanc in the Alps. And ever since her first expedition across Svalbard in 1993 she has participated on several challenging trips around the world. Vibs or Vibi, as she is called, has climbed all the 7 Summit Peaks and 4 of the 8000 meter peaks. After the earthquake in Nepal 2015 she has been living in Nepal for more then one year to help rebuild the country. Now she is running several projects to help make a better future for needy people of Nepal. Among the projects are an orphanage and a drop-in center for street children, a sewing and weaving factory for females, two health stations and six schools. From August 2017 she will work with refugees for UN in South Sudan. Follow all her new challenges here.